Pro-Touring? Does this sound like grandma cruisin’ Route 66 in a Mercury Marquis? Try Again! For those hiding out in your garage working on your own hot rod in the last 5 years, Pro-Touring cars are classic muscle cars modified to be driven hard with modern hot rodding technology. Call it Pro-Touring or G-Machine, everything on these tricked out rides is upgraded and modern: Late model or aftermarket suspension, big horsepower engine, and body mods to fit those giant wheels with low profile tires and big brakes. New school muscle with old school style. Buckle up. 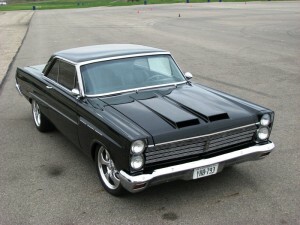 OK, let’s have a look-see at Josh Martin’s 1965 Pro-Touring Mercury Comet Caliente then shall we? A few magazines are planning to feature this track day-ready Comet, but the details are not set. In the meantime, MyRideisMe.com delivers the latest and greatest in hot rodding. We say, why wait? Type in your email address over on the left and you’ll receive stories like this right to your inbox. 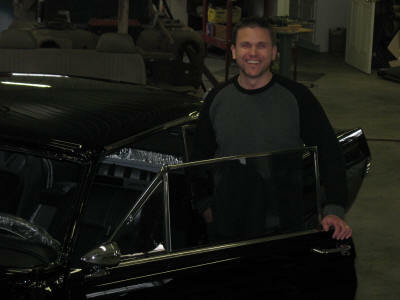 Filling you in on the Comet build then, meet car owner, Josh Martin. MyRideisMe: All dream cars start with just that, a dream. Personally I’m a big fan of the Comet. Tell us about yours and why you built a Comet? Josh Martin : I chose the 1965 Mercury Comet after seeing the 1996 movie “Swingers.” (“Baby, that was money! Tell me that wasn’t money!”) I loved the look of the car in the movie so I researched and found out it’s a ’64 Comet convertible. 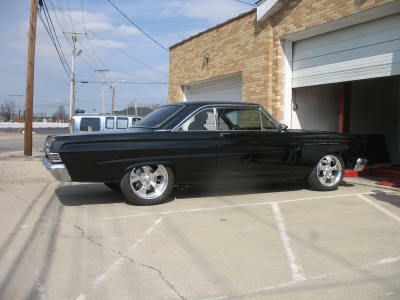 Then I saw a 1965 2-door hardtop and it blew me away. It was the best looking car I had ever seen, and I knew that this was the car I wanted. MyRideisMe: Once you knew you wanted the Comet, what were your plans and why? Josh Martin: I researched shops, and talked with a few before choosing Woody’s Hot Rodz in Bright, Indiana. Woody’s started from a small operation out of a garage and grew to a shop doing multiple high-end builds. I also knew that I wanted to do a Pro-Touring build, using the original Comet body, but upgrading everything with new parts (chassis, engine, brakes, interior, etc.). Woody’s was doing pro-touring builds based on the Art Morrison Max G chassis. So, Woody’s was a perfect fit. MyRideisMe: So, where did you find the actual car? 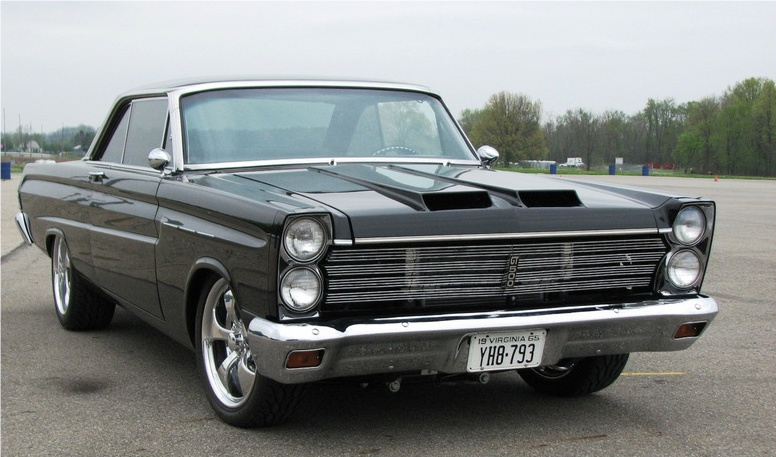 Josh Martin: The 1965 Comet is not a super rare car. We didn’t care about the engine, brakes, etc., but we needed a solid body with as little rust as possible (other than the floors, which would be cut out and rebuilt anyway). We found a perfect car on Craigslist that was located in California. MyRideisMe: So, tell us about the build itself and working with Woody’s Hot Rodz? Josh Martin: The project started in the spring of 2006, when the car shipped from California to Woody’s. I had a list of ideas for the project from writing down general concepts that I wanted for the car. I sent pictures of other cars that had design features I liked, and then I left it up to Woody’s to fill in the blanks and execute. Throughout the three year build, Woody’s and I have been in constant communication about what parts to use, how we want certain things to look, and other details. Woody’s has done an amazing job building the car I envisioned. MyRideisMe: Now, one of the coolest parts of this build is that Shelby GT500 5.4L Supercharged V8 shoehorned into that small block Ford bay! Josh Martin: Right, we originally had planned on a 4.6L mod motor. After the build was already under way, I saw the GT500 5.4L engine. I called Woody’s and we went over all the potential problems, like, how do we get that wide/tall engine to fit, how do we control it (brand new engine not sold with a wiring harness), and is it too heavy for balanced handling. We decided that it was worth the headaches given that there really wouldn’t be many (any?) non-Mustang cars with this engine. And, once again, Woody’s came through. We located an operation that could sell us the engine, harness, and a programmed computer. Finally, a few modifications to the hood and engine bay and it slipped in. MyRideisMe: Let’s take a look at the rest of the build. What else makes this car stand out? Josh Martin: Both Woody’s and I would come up with ideas, and then we’d talk them through. For example, we didn’t like the original Comet mirrors so Woody’s came up with the idea of using bullit style Mustang mirrors. Since the Comet was a stable mate with the Mustang, the mirrors fit without any real modification. Woody’s also came up with a number of original design features. 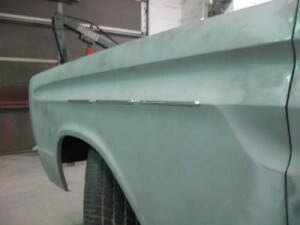 The original 1965 Comet had three plastic front fender badges. We liked the general look, but wanted to update them. Woody’s came up with cool metal badges. Woody’s also added a center rear brake light between the trunk and the rear window that sits flush with the surface of the car. Custom LEDs now reside in the taillights. Check out the modern take on A/FX hood scoops too. Woody’s also took the old grill emblem (which was red, white, and blue) and changed it to a black and silver “GT500” emblem. I think it’s cool because we removed all the name badges from the car (it actually does not say “Comet” anywhere on the car). As for the interior, Woody’s has been using Barry Langdon Interior for years, and Barry did a great job using black leather on the seats and a really cool center console design. Engine – 5.4L supercharged Ford SVT engine from the new GT500. Transmission – T56 six-speed (modified). Josh Martin: We set out to create a car that looks like my favorite old car but that performs like a new performance car. It has been quite a journey (three years) , but we got to where we wanted to be. I could not have done it without the help of people on the Pro-Touring.com Forums, whether it was ideas, opinions, or just encouragement. The relationship I’ve formed with the guys at Woody’s Hot Rodz has been awesome, and I’m sure it will last a long time. I can’t wait to get the Comet on the road and to the track, but the journey itself with all of its ups and downs has been a huge part of the fun. Thank you Josh and Woody’s for sharing your Comet story with us at MyRideisMe.com. All photos have been courtesy of Woody’s Hot Rodz. Not really enough room to showcase each custom touch, but you can see all the build photos at Woody’s Hot Rodz Project page and get all the details of Josh’s Comet build on the Pro-Touring forums. Whether its traditional hot rods, rat rods or Pro-Touring cars, its all about making our Rides our own and that’s exactly what MyRideisMe.com is all about! Awesome – No doubt this car will show up on one of the TV Car shows. VERY cool car and great story, too! All of the little details really make the car pop… Thanks for sharing! Great article Josh & myrideisme. Just for your information Josh, if the “beauty” is ready, you would kick a$$ at Ford Carlisle (Jun 5-7). “Miss Daisy” and I couldn’t handle the competition but we would be there rooting for you! Congratulations again on being ‘almost’ there! Josh;I’m usually not a G-machine fan as so many are too tacky,proportions are off,but you guys have nailed the look and[hopefully]the performance.Your Comet has turned out BEAUTIFULLY ! Of course I am a bit biased,being a 65 Comet owner more than 42 years! ROY. Thanks, this helps get the spark back in my 1965 comet 404. What a beautiful ride you have. Hopefully I’ll get to see it in person someday. Please let me know how the new hood scoops were put on I am in the process of doing a real cyclone 1965 and love the look of the hood scoops. 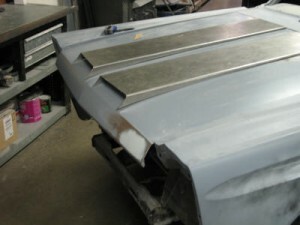 New hood or fiberglass? If new where can I purchase one?. Or just the scoops. I have a nice oriiginal steel hood but no scoops. Crites have an AFX fiberglass hood but really like the looks of yours. 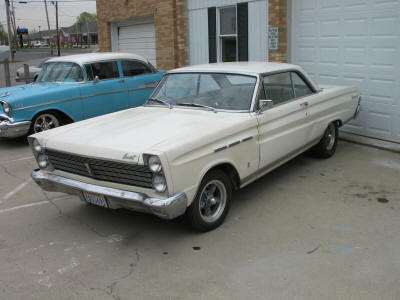 Being a previous owner of a1965 Comet “Cat”, I enjoyed this article very much! Their is a shop in Bartow Florida called Lloyds that does this type of restores and some of their customers have been featured in Hot Rod and Two Guys Garage. Good Luck with your Comet. It is awesome! Great car, Put ifs front end on my comet with stroked 351w with rear sump pan motor sits up about inch more. 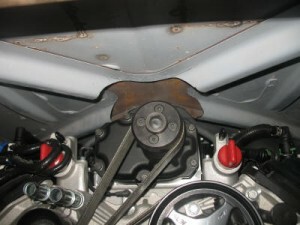 looking for the right fit for headers any suggestions that will clear stock clutch linkage. and sterring shaft from the mustang 2 steering . 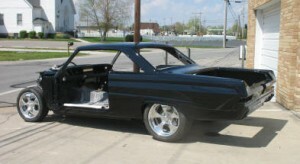 Josh I owned a 1965 Comet in 1965, it was my 1st new car,I bought it just after I got out of the Marine Corps,I have been wanting to build one, it just so happens that yours is pretty close to what I had in mind, is the car for sale.